An amazing new satellite, designed to peer down on the West Coast and Hawaii, started transmitting stunning images last week, when heavy snows blanketed parts of Alaska while California wildfires sent plumes of smoke into the air. The satellite is called GOES-17. 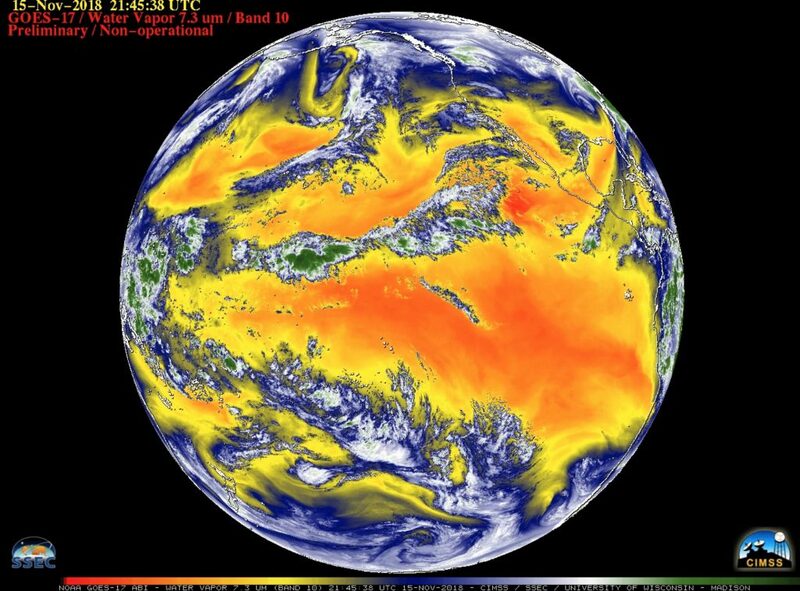 CLICK TO LAUNCH ANIMATION — This full-disc image of the Earth, taken Thursday, shows clouds at three altitudes: Band 10 is low-level; Band 9 is mid-level; and Band 8 is upper-level. “With GOES-17’s coverage area now centered over the Pacific Ocean, we now have high-resolution geostationary satellite coverage of Alaska, Hawaii and much of the Pacific Ocean for the very first time,” states a news release from the National Oceanic and Atmospheric Administration. GOES stands for Geostationary Operational Environmental Satellite. GOES-17 will remain in stationary orbit at 137.2 west longitude and 22,300 miles above the equator. Much of the equipment in GOES-17 uses the same advanced technology as GOES-16, also known as GOES East, which covers the East Coast. See map below. The high-altitude satellite can send crystal-clear images rendered in natural color as well as enhanced through special sensors to heighten images of clouds, sea ice, volcanic ash and wildfires. The Advanced Baseline Imager, or ABI, views the Earth with 16 different spectral bands, compared to five in GOES satellites from previous generations. See NOAA’s article on ABI. The new satellite can collect three times more data at four times the resolution and scan the Earth five times faster than earlier satellites. That will give meteorologists access to more information to run their weather models and produce more reliable forecasts. See NOAA article about this “game-changer” satellite. The GOES-17 satellite was launched from Cape Canaveral on March 1 and remained in a temporary “checkout” position at 89.5 degrees west until Oct. 24, when it began moving to its new position. The relocation, technically known as drift, is explained in another NOAA news release from Oct. 22. GOES-17 is undergoing further testing. If things go well, it will be fully operational on Dec. 18, when people may start to call it the GOES West satellite. 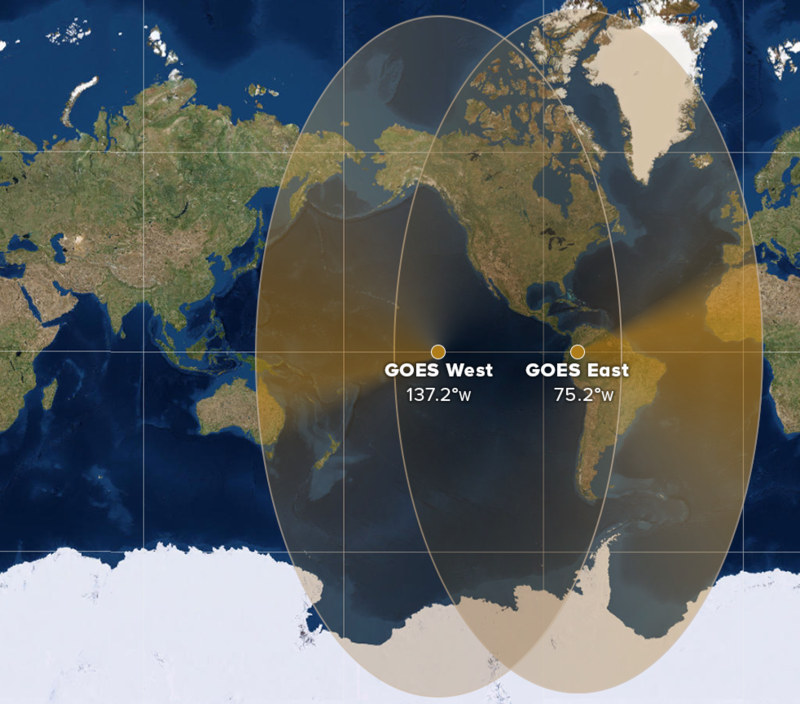 The current GOES West satellite, GOES-15, will be operated in tandem with GOES-17 for at least six months. ABI band 8 (6.2 μm) is upper-level water vapor.